Misfit's Shine 2 is a good choice if you're just looking for a basic step tracker with long battery life and a stylish design, but the Shine 2 won't be ideal if you want a fully fledged fitness tracking device. Misfit may not be the first wearable brand that comes to mind when you think of fitness tracking tech, but it is trying to do something quite different to the Fitbit, Nike’s and Jawbones of the world. Most of that is marketing speech, but it proves Misfit is trying to do something different and that’s how we’ve ended up with the light and unusual Misfit Shine 2 on our wrists. Its jewelry-like design also has the benefit of six month long battery life, something you won't get from a lot of competitors products. But is it just an accessory or will it actually help make you fitter? You’re able to buy a Misfit Shine 2 from the official Misfit website now, or you could even pick one up in any good jewelry shop. It didn’t launch at the cheap end of the market though, with an initial price close to a brand new mid-range Fitbit device, at $100 (£80 or AU$137). Now Misfit has dropped the price of the Shine 2 to $69.99 (£55.99, AU$79.99), making it a touch more affordable and a similar price to a Fitbit Flex 2, rather than the Charge 2. The first thing you’ll notice about the Shine 2 is it doesn’t have a traditional display. We’re used to minimal screen in fitness trackers, such as the Fitbit Charge HR, which had a tiny display, but this literally has no display at all. Instead you’re greeted with a circle of lights to communicate information to you. This may seem confusing at first – and it is, believe us – but it will save on the battery life of your tracker and you’ll be surprised by how little you need a display on your wrist. You can tap on the Shine 2 and it will tell you the time with its 12 LED lights. You'll also get information on how well you're doing with your step target, but for anything extra you'll need to open up the Misfit app on your phone. The Shine 2 is light, and you’re unlikely to find another wearable device this unsubstantial. Some fitness wearables can be big, chunky devices that are often uncomfortable, but we found the Misfit Shine 2 to be so light it would barely be noticeable during your day-to-day business. In fact, the device itself is only 8.5 grams. As such, there were multiple times during our review that we completely forgot we were wearing the Shine 2. The strap could do with some upgrading though. It doesn’t feel particularly secure, so we’d recommend getting a new strap if you can. Misfit sells a Field Strap in leather or nylon, but at $50/£60/AU$50 this is seriously expensive. But it could be something to consider, as with the standard band the Misfit Shine 2 does sometimes feel like you’ve not strapped it in enough, especially when exercising. Strap aside, you've got a large color range to choose from for your Shine 2. The device itself can be black, rose gold, pink, gray, navy or red. The pink and red options are certainly not to everybody's taste, but if you want to make an impact with your fitness tracker these choices will suit you perfectly. The other thing to note about the Shine 2 design is its unique look. 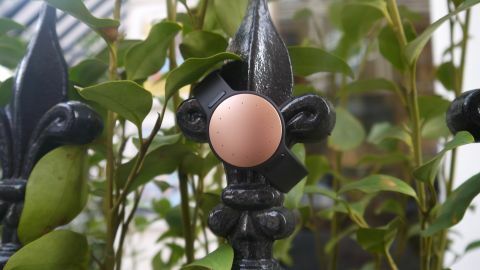 Misfit is creating devices that look different to everything else you can buy, and you don’t need to look any further than the Shine 2 to realize that. While wearing the device, we were asked numerous times what we had on our wrist, and in some cases people were genuinely fascinated, as it looks so strange. With a round shape, people automatically expect it to be a watch, but then are struck by its lack of screen. You can also wear the Shine 2 anywhere on your body, which is a big benefit you don't get from most other fitness trackers. Pop the Shine 2 out of its strap and you can use a clip - which is included in the box - to attach it to your trousers or even your shoe. Misfit even sells necklaces for you to plug the Shine 2 into. If you want a fashion-focused fitness tracker, the Shine 2 is certainly a strong option.